Here is a very small sample of what a few of our peers got up to this June on the global day of action. The campaign season is kicked off by the SDP campaign - next of course is International Remembrance Day on 21st July and International Overdose Awareness Day on the 31st of August. What will YOU be doing?? Arild from the Norwegian Drug User Union took the Support.Don't Punish Campaign to the Kazakhstan Embassy, like many others across Europe - to protest against the end of OST. Nice one Arild! We also did this in London, standing together with our peers in Kazachstan! 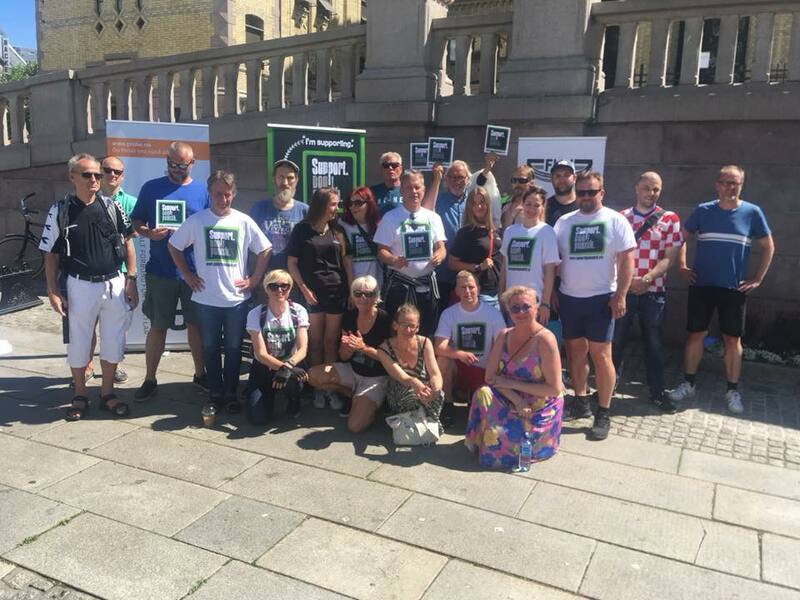 ProLAR in Norway held their event in a large group in Olso the capital. ProLar says: In Norway there are about 35 - 40 women that gives birth every year In OST. We have guidelines that say that women are supposed to stay on their medication thru pregnancy, but still, there are alot of presumption of guilt from others.. Thats why we started this project. To give these mums some oppurtunity to meet others, and to talk and get stronger in their faith to keep going, and not to feel guilty. We started our work to show the public and the academic profession that women most certainly are in a position to take care of their children even/also if they are on OST treatment. Written by Ronny. 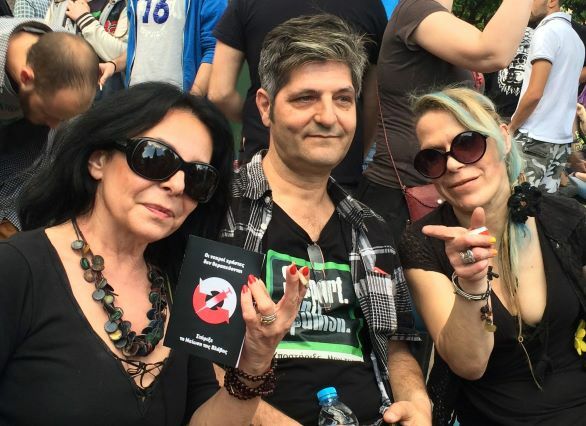 Here, representatives from the Greek peer network of users of Psychoactive Substances (PeNUPS) promoted live in the Greek public state TV 📺 the message of #supportdontpunish and advocated for the rights of the community of PWUD. Nice work -to EuroNPUD's own Christos Anastasiou who went onto Greek TV!!! (Christos is middle in pic) (Problem with the video link - will try and amend this asap follow link and click here. Christos Anastasiou spoke to us for the blog and said "We collaborated with some of the NGOs who work in the Drug field in Greece for the event, and, through some negotiations, we secured our leading role for the event .The event took place outside the Law university where there is a open field drug market in the centre to make people take notice. It is also the terminal of the buses on the other side of the street. We had progressive speakers, and cold food juices and soda. We also had 4 speakers: the State Human Rights Secretary, one famous writer who publishes very clever critic about the leading role of the KETHEA ,one gay police officer who is really very progressive and responsible for human rights in the police ,and the best director of OST programs that we want to give an award to ! The event was very nice , most of our members and all the volunteers and stuff from the NGOs came, along with the cannabis groups who also shared the day. Abstinence and harsh “rock bottom” programs are pushed by the Greek national drug strategy and most of the people think that is the only way ! Its established everywhere even in our universities We are pioneers here for asking real evidenced based treatments and the full spectrum of harm reduction ...People gained courage to try to defend ourselves for better OST ,DCR, and all the HR interventions. It was a great day! I must aslo add, we got onto State TV to talk about why PWUD must be involved in the issues that affect our lives"!! Wonderful news Christos! Here's to the Greek PeNUPS!!! Montenegro's SDP campaign went for the whole day into the night and was considered a great success, with much media coverage! Marija Milić shared with us news from Montenegro! "On the 26th of June 2018, NGO Juventas, along with Montenegrin Harm Reduction Network, marked the campaign night in Podgorica, the capital of Montenegro, at the venue “Koncept Art Space”. The tribune was very productive as every person present were involved in the discussion, giving us as facilitators of excellent inputs for the future planning of activities with the youth. After the tribune, documentary movie about harm reduction in Montenegro was played for the first time in public, as well as documentaries from region, all filmed by Drugreporter from Hungary. The venue where the event was held is near the Government building, and we wanted to draw the attention by placing a big “Support. Don’t Punish” sign on venue’s window. The reason why we have held an event like this – we wanted to attract as many people from the community, to hear our stories, to hear what are we fighting with and to realize that people who use drugs have voices too. On 27 June, the last activity was held and included setting up an information stand at the Faculty of Political Sciences of the University of Montenegro. The night of the campaign was preceded by the opening of Facebook page “Support. Don’t Punish. Mne”, organization of venue, the engagement of photographers for the production of photographs for labels, posters and programs for the campaign, printing of prepared material, engagement of participants, refreshments and transportation. A flash mob and stall was be put on in the town centre where merchandise and questionnaires/surveys/forms were handed out relating to the campaigns aims and objectives followed by an HR café type event in local public house along the main street where the more prominent topics from the day were discussed in more detail and a questions and answers session followed a presentation on and around the campaign..
Support Dont Punish -The. action against prohibition and criminalisation of drug users in Berlin..... organised in Berlin of a group of Russian drug users. Fantastic guys! Speak out - loud and proud! EuroNPUD are still gathering pictures from people -so we hope to bring you more about what people got up to. We look forward to the next global days of action this July and August! Stay tuned!